Chicago is a brilliant place to be a food geek, especially if you’re friends with people who run food co-ops like Edible Alchemy. Normally The Husbeast and I get our produce from the various farmer’s markets, but out of season, the produce shares from EA never fail to offer excellent fodder for food experiments. For instance, our last share yielded the single biggest leek I have ever seen in my life. 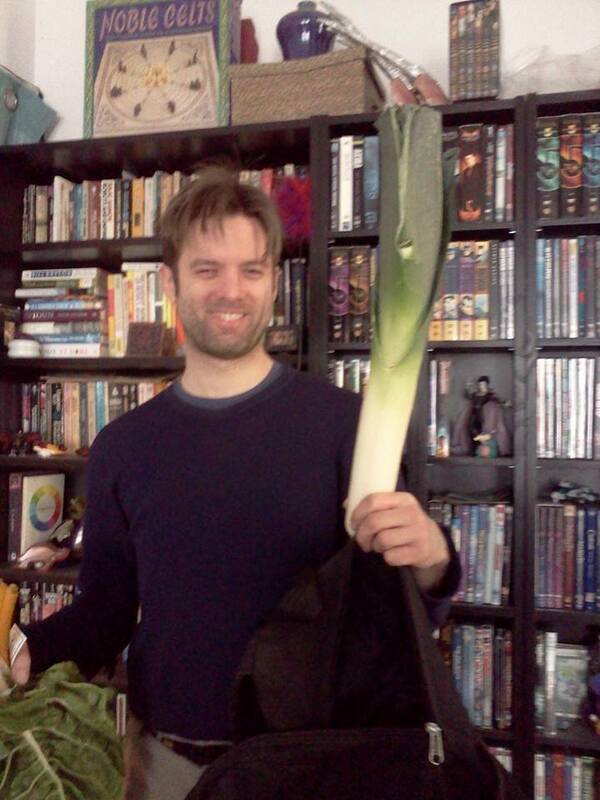 I’m pretty sure Husbeast could have used that leek as a cricket bat. I kept thinking that I’d do something like make soup with it, but two weeks went by and suddenly it was “Oh crap, I need to use that leek or see it go to waste!” time. Unfortunately, the migraine I’d been dealing with for two days meant I hadn’t been to the grocery store, so now that meant if I wanted to make soup, it was going to involve looking through the fridge and pantry and pulling out whatever would work with the leek. The texture was perfect – rich, smooth, comforting and no cream necessary (which meant that I could share this with the almost-vegan Husbeast). The slightly licorice-like fennel was balanced out by the potato and apple, and the turmeric added a lovely bite, as well as color. Croutons, crispy pancetta or bacon, and/or some shredded asiago or parmesan with fresh herbs (I’d go for chives or parsley) would be great for garnish. This is actually pretty easy to prepare, as well. 1 LARGE leek (so equal to 2 reg. size leeks) – white and lower 2/3 of the green parts, rinsed, split in half lengthwise and chopped into half moons. 1. Heat butter in large stock pot and add all veggies to pot on med-high for 15min (lower heat if leeks start browning). The veggies should start softening. 2. Add apple pieces, 1/2 cup water and seasonings. Simmer for 10min. 3. Add remaining 4 cups of water and simmer for 20min. Blend using a hand blender or in batches with a stand blender. Serve. Will keep in the fridge for several days, or freeze. Assuming it lasts that long. Also, because this is leek-related, I have to include this link. 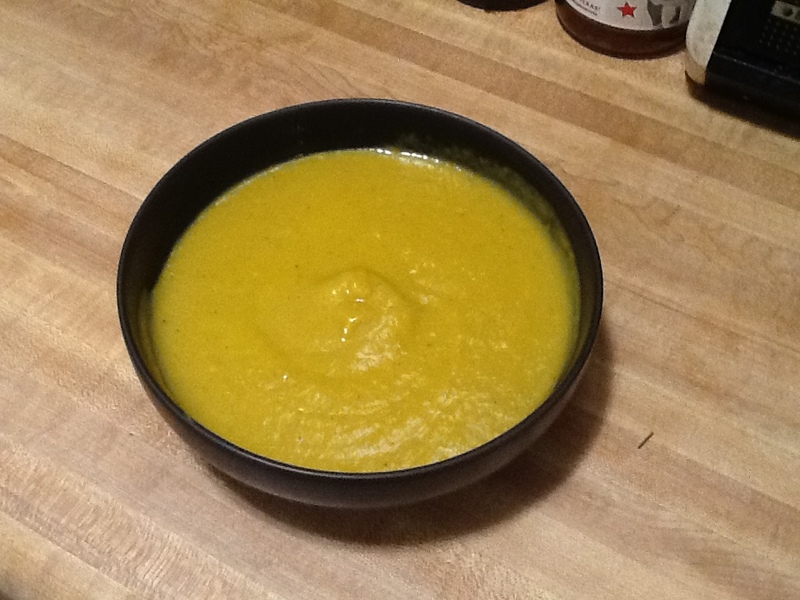 This entry was posted in Food and tagged apple, fennel, kitchen experiments, leek, potato, recipe, soup by Michi Trota. Bookmark the permalink.